BUY NOW FROM GOOGLE BOOKS! Rachelle Loyear understands your situation well. Her challenge was to manage Business Continuity in a large enterprise that required hundreds of BC plans to be created and updated. The frustrating reality she faced was that subject matter experts in various departments held the critical information she needed, but few were willing to write their parts of the plan. She tried and failed using all the usual methods to educate and motivate – and even threaten – departments to meet her deadlines. Finally, she decided there had to be a better way. The result was an incredibly successful BCM program that was adopted by BCM managers in other companies. She calls it “The Three S’s of BCM Success,” which can be summarized as: Simple – Strategic – Service-Oriented. 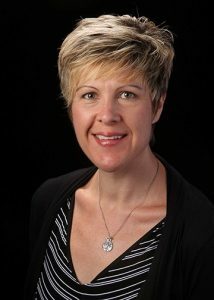 Rachelle Loyear, MBCP, AFBCI, CISM, PMP, has spent over a decade managing various projects and programs in corporate security organizations, focusing strongly on business continuity and organizational resilience. In her work life, she has directed teams responsible for ensuring resilience in the face of many different types of security risks, both physical and logical. Her responsibilities have included: Security/business continuity management program design and development; crisis management and emergency response planning; functional and location-based recovery and continuity planning; training in crisis management and continuity ; operational continuity exercises; logistical programs, such as public/private partnership relationship management; and crisis recovery resource programs. She began her career in information technology (IT), working in programming and training design at an online training company, before moving into the telecommunications industry. She has worked in various IT roles – including Web design, user experience, business analysis, and project management – before moving into the security/business continuity arena. This diverse background enables her to approach security, risk, business continuity, and disaster recovery with a broad methodology that melds many aspects into a cohesive whole. Rachelle holds a bachelor’s degree in history from the University of North Carolina at Charlotte, and a master’s degree in business administration from the University of Phoenix. She is certified as a Master Business Continuity Professional (MBCP) through DRI International, as an Associate Fellow of Business Continuity International (AFBCI), as a Certified Information Security Manager (CISM) through ISACA, and as a Project Management Professional (PMP) through the Project Management Institute (PMI). She is active in multiple business continuity management industry groups, and is vice-chair of the Crisis Management and Business Continuity Council of ASIS International as well as serving on the IT Security Council. 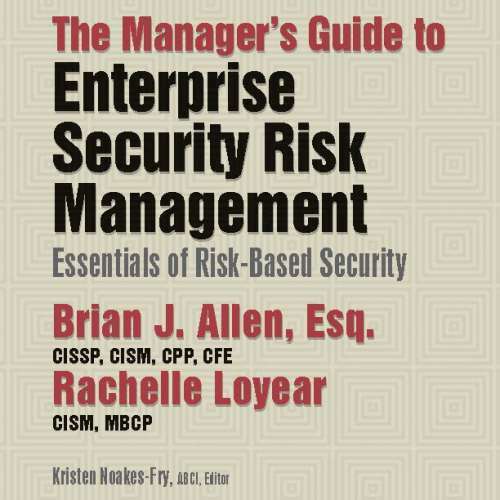 With Brian Allen, she co-authored The Manager’s Guide to Enterprise Security Risk Management: Essentials of Risk-Based Security (Rothstein Publishing, 2016). 6.5 Plan Management Software – Benefit or Barrier? Chapter 9 – Final Thoughts – Where Do You Go From Here? Business continuity planning and management (BCM). It’s a topic in most organizations that brings a lot of enthusiastic agreement about the critical need to do it, and often a lot of head ducking and looking the other way when the actual planning needs to be done. It’s no secret among BCM professionals that the most difficult part of managing a continuity program is gaining traction for the work. While executives often claim to support the need for a robust BCM program, the reality of having to run the business and deal with day-to-day work often takes priority when “to do” lists get long. At the same time, in a best-case scenario, personnel in the organization understand the need for a plan in case something goes wrong, but may not have the time to devote to plan development or documentation, or sometimes even really know where to start. At worst, they see the entire exercise as a waste of their valuable time. After all, they’ve been doing fine so far without a plan. Why go to the trouble of taking time out of their already busy schedule to develop one now? All these things can lead to the actual work of planning being handed off from person to person until it gets to the one person who has no one left to hand it to. And, sadly, that person often does not actually have the information needed to put together a real, workable plan. If this sounds familiar to you, then you are not alone. In countless conversations with BCM professionals I’ve had over the years, I have heard again and again the lament that they didn’t have enough support, or authority, or resources to get the job of planning done. I was in the same position. I was responsible for several hundred department plans for an enormous enterprise, yet the reality was that I had few subject matter experts willing to write them, no matter how many software training classes I gave or how many “your deadline has passed” emails I sent. How with a change in your mindset and program, you can gain an incredible amount of traction and support from all of your BCM program partners in the business who have the critical information needed for your BCM plans. How you can change from having people in your organization avoiding you in the hall, aware that they have missed yet another planning deadline, to having them actively seeking you out when they have an update to make to their plans. In Part I of the book – for those readers who might be new to the world of BCM – I give you an introduction to what BCM is and a high-level overview of what it typically encompasses. Then I dive into the topics of why BCM seems so complicated to so many of the BCM program partners that you must engage with to build and manage plans. In Part II, I show how you can change that complexity, and reboot your BCM programs using the 3S model to gain internal traction, participation, and support. Finally, in Part III, I cover how to put it all together to run an ongoing program that will support your organization’s needs now and into the future. Throughout this book, you will see boxes with what I am calling “Stories from the Front Lines.” These are real-life stories that I’ve collected from BCM professionals at conferences, seminars, and training sessions, and also some from my own experience. Names of people and organizations have been changed to protect the innocent. These stories are told in first person as they were told to me. Some may have happier endings than others, but if you have worked in the BCM field for a while, many of them will sound familiar to you. If you have not, then these real life “war stories” will hopefully provide you some “dos and don’ts” for implementing your own BCM program. At the end of each story, I include a few “Life Lessons Learned” bullet points to show you how using any one of the 3S aspects either helped or could have fixed the issue in the story. See how three little words can change your work life. …then let’s get started on learning about building better BCM! Simplifying your business continuity management (BCM) program for your program partners and subject matter experts does not need to make it more complicated for you. In fact, the simpler your program, policy requirements, forms, templates, questionnaires, and calculations, are, the easier you make it on yourself and your team to ensure enterprise compliance with the BCM program. In a complicated world of ever-changing risk, with multiple moving parts and interlocking dependencies, making your program simpler is possibly the best way to ensure you cover all your bases with high level plans. Planning at the most detailed level is overwhelming at best, and counter-productive at worst, as the pieces and parts change so rapidly it’s almost impossible to keep up. When setting up a simple and streamlined program, I recommend a phased approach. In this, I agree with most of the available standards and guidelines that also recommend a step-by-step implementation, but the approach outlined below is both phased and narrowed down to the essentials. There’s no point in attempting to phase in an enormous and complicated program when you can phase in a lean and nimble one. Initiating a new BCM program. Analyzing the business needs for a BCM program. Building the program and program components (plans). First things first. If you are going to either start up a new BCM program or revamp your existing program to conform to the 3S model, there are some things you will want to do upfront. We write it for you. Your executives will want to be reassured that the simplified model will meet company continuity preparedness needs. Your BC planning partners will need to understand that they are still responsible for ending up with plans that work for them, even if you are providing the majority of the assistance in creating those plans. You (and your team or helpers) will need to clearly communicate the process that you ill follow to get the program rolled out, tested, and then migrated into the ongoing maintenance and improvement phase. So what’s the best way to accomplish these goals? 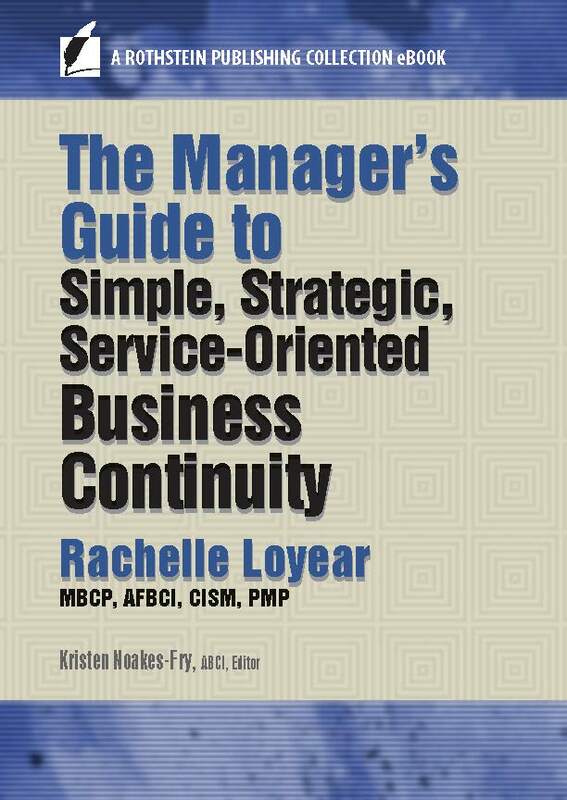 Business continuity plans must be simple, strategic, and service-oriented: that is the key message of this book by Rachelle Loyear. The author advocates a new model—the Three S Philosophy—as an approach to improve engagement and support for business continuity management (BCM) programs. Traditional BCM programs face various challenges and roadblocks that make them cumbersome for business subject matter experts and even for the experienced risk professional. To counter those obstacles, Loyear urges planners to focus on the essentials, stripping away complexity and putting strategy and business value front and center to help the risk owner in the BCM journey. This guide will provide great value for anyone engaged in BCM, whether as an experienced risk professional or a functional expert. The Three S Philosophy, which endorses simplicity, strategy, and service, provides a powerful yet uncomplicated framework that a focuses on value. The reader will appreciate various references in the manuscript to enterprise security risk management, as well as practical templates and checklists to facilitate further use. Reviewer: Rachid Kerkab has almost two decades of experience in criminology, strategy, risk, and resilience. He is a member of ASIS.